AbstractLogix has released NOW, the new album recorded by Alex Machacek and Gary Husband at Manifold Recording. It is an album you may well want to check out NOW! It is always exciting to think about what might happen when two of your favorite artists decide to team up and produce a new collaboration. But it can also be a disappointment when the result sounds a bit like a tug-of-war between two visions, or a competition between the two artists. NOW not only avoids the these pitfalls, but it soars above them with rare and wonderful transcendence. Indeed, it may do for Piano and Electric Guitar what Crystal Silence did for Piano and Vibraphone. Alex Machacek and Gary Husband spent several days with us recording a new album for their label, AbstractLogix. Gary has just finished touring the East Coast with John McLaughlin, and Alex flew in from Los Angeles. Both had been writing, practicing, and sharing notes about the music they would be recording, but this was the first time they had a chance to play it together. 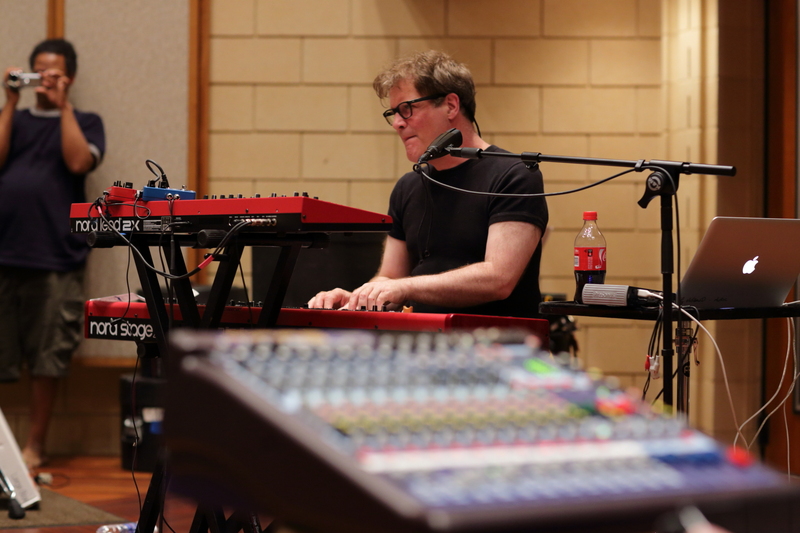 It was exciting to witness the music literally being realized through the process of recording! For the acoustic guitar, Alex auditioned two of our studio guitars: a Breedlove and an Alvarez Yari. Alex picked the Yari because its tone and action fit were a perfect fit for the tone he envisioned and for the way he plays. Gary played our Yamaha CF-9. 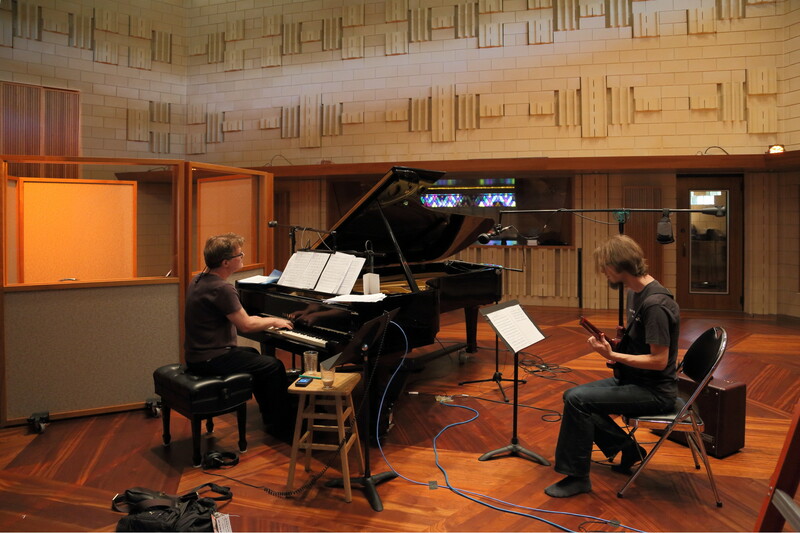 We set up three pairs of microphones to capture several perspectives of the piano’s sound. Over the hammers we had a pair of Schoeps CMC6 mics. Over the harp we had our DPA 3521 compact cardiod pair. Slightly higher and slightly farther away we had a pair of Coles 4038 ribbon microphones which you can see on the large boom stand. Ian then set about to get the piano to play Gary’s favorite colors, which tended to be a bit darker than our piano plays naturally. However, after some back-and-forth, we found that we could get the desired color with a touch of EQ. With that, we were ready to record.